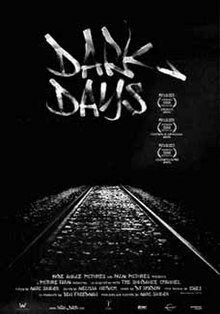 Dark Days is a documentary feature made by British filmmaker Marc Singer, shot during the mid-1990s but not completed and released until the year 2000. The film follows a group of people living in an abandoned section of the New York City Subway system, more precisely the area of the so-called Freedom Tunnel. When he relocated from London to Manhattan, Marc Singer was struck by the number of homeless people he had seen throughout the city. Singer had befriended many in New York's homeless community and later, after hearing of people living underground in abandoned tunnel systems, he met and became close to a group of people living in The Freedom Tunnel community stretching north from Penn Station past Harlem. After living on and off with them for a number of months, he decided to create a documentary in order to help them financially, even though Singer had never been a filmmaker before. He saw the production of Dark Days as a means of gaining better accommodation for the residents of the tunnel. The film's crew consisted of the subjects themselves, who rigged up makeshift lighting and steadicam dollies, and learned to use a 16mm camera with black-and-white Kodak film. The post-production process took years, as financial difficulties created delays, as did Singer's insistence of creative control to protect the tunnel residents. During filming, Amtrak announced they would be forcibly evicting the homeless living in the tunnels in order to reroute their trains through the tunnel. This announcement, plus the police presence backing the decision, prompted Singer and photographer Margaret Morton to go to the Coalition for the Homeless for help. Eventually, Singer and Morton managed to secure housing vouchers from the Department of Housing and Urban Development for the film's subjects, which enabled them to move out of the tunnels and into their own apartments. Melissa Neidich was the editor of the film. Cinevision, a New York City camera shop, supplied Singer with cameras for the two-and-a-half years of filming. When Singer ran out of money for film, Kodak supplied free damaged film for the project. The film features music by DJ Shadow, including excerpts from Endtroducing..... as well as his album with Unkle. He also composed original music for the main theme of the film, released on the single "Dark Days". Dark Days was released in 2000, and was nominated for several film festival awards. The film won many of these, including the Independent Spirit Award for Best Documentary Feature, the Los Angeles Film Critics Association Award for Best Documentary Film, the Senior Programmer's Pick to March Singer at the 2000 SXSW Film Awards, and three Sundance Film Festival awards in 2000: the Audience Award Documentary, the Excellence in Cinematography Award Documentary, and the Freedom of Expression Award. Oscilloscope Laboratories re-released "Dark Days" theatrically at Cinema Village in New York City on July 1, 2011 as well as on DVD on July 19, 2011. The DVD contains several new features compiled especially for its special tenth anniversary re-release, including footage of Singer revisiting the Freedom Tunnel in 2011. The film was also re-released by Dogwoof Pictures in the UK, including the additional features and interviews. ^ a b c d e f Debruge, Peter (10 November 2000). "Dark Days: How a Manhattan Homeless Community Helped Make the Year's Most Stirring Documentary". The Austin Chronicle. Archived from the original on 20 December 2002. Retrieved 20 December 2002. ^ a b c d e f Goodman, Amy (30 August 2000). "INTERVIEW: Dark Days: The Ultimate Underground Film". IndieWire. Archived from the original on 13 June 2017. Retrieved 13 June 2017. ^ a b c d Robey, Tim. "Dark Days, review". The Telegraph. Archived from the original on 13 June 2017. Retrieved 13 June 2017. ^ "Dark Days (2000) Soundtrack". RingosTrack. Retrieved 14 June 2017. ^ a b "Oscilloscope to re-release "Dark Days;" documentary won three awards at Sundance 2000". IndieWire. Archived from the original on 29 June 2017. Retrieved 29 June 2017. ^ Debruge, Peter (10 November 2000). "Dark Days". The Austin Chronicle. Archived from the original on 29 June 2017. Retrieved 29 June 2017. ^ "2000 Sundance Film Festival". History.Sundance.org. Sundance Institute. Archived from the original on 29 June 2017. Retrieved 29 June 2017. ^ "Dark Days". Dogwoof.com. Dogwoof Pictures. Retrieved 14 June 2017.